We carry the largest assortment of beer coolers in Thailand from the smallest over counter dry cooler to the largest under counter wet cooler. Dry coolers do not have an agitator nor a water bath which mean these coolers cannot be used if you want to have a beer font/tower on the bar counter (for which cold water needs to be pump in the python between the cooler and the tap). In other words, if you prefer to have a beer font/tower on the bar counter you need to use an under counter wet cooler(s). If you have a steady flow of draught beer you can use over counter dry coolers. If you have peak hours of pouring draught beer where you pour almost non-stop you cannot use dry coolers as these need time (15 +/- seconds) to cool the chill plate before you can pour the next glass. In this case you need a wet cooler. If you have large events with many people all demanding a glass of beer within short time you need a wet cooler(s). Over counter dry coolers are easy and fast to set-up because they do not have a water bath. Just plug in the power and you can start serve cold beer within 15 minutes. Easy to move around for instance in a hotel, restaurant or resort to serve the cold beer where needed. Wet coolers need more time (2-5 hours depending on model/size) to set up. All our over counter dry coolers are produced by Lindr in Czech Republic. For wet coolers we both import from Lindr and manufacture ourselves. Since the beginning, Lindr has been going its own way with own original products, having been both as for the technical side and its own irreplaceable unique design. Using a high quality polished stainless steel in combination with natural hardwood leads to entirely original and ageless details. Both ideas and innovations of Lindr have been highly successful on the Czech, European and world markets. Lindr's development and innovations always includes the requirements and experience of its customers, and the company keeps the best ratio of performance / quality / easiness/ design / price. Every year the company enriches the market with entirely original innovations. 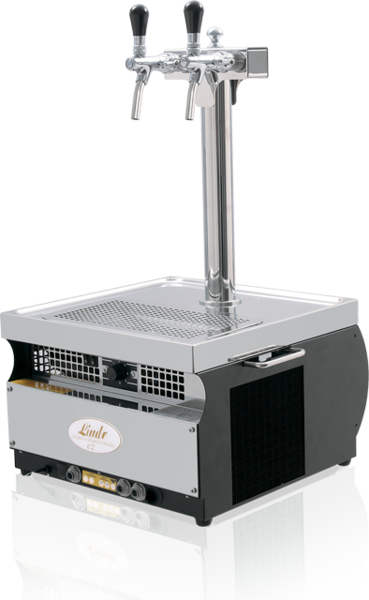 At present, Lindr has the widest range of dry beer coolers and of coolers with the smallest dimensions as for the given performance on the European market. Working with these coolers you need CO2 gas or external air compressor. As the over counter dry coolers do not have a water bath the set-up time is very short. Just plug in the power and you can start serve cold beer within 15 minutes. Easy to move around for instance in a hotel, restaurant or resort to serve the cold beer where needed. If you have limited space in your venue but still like to have beer on draught these coolers suits you well due to the compact design. 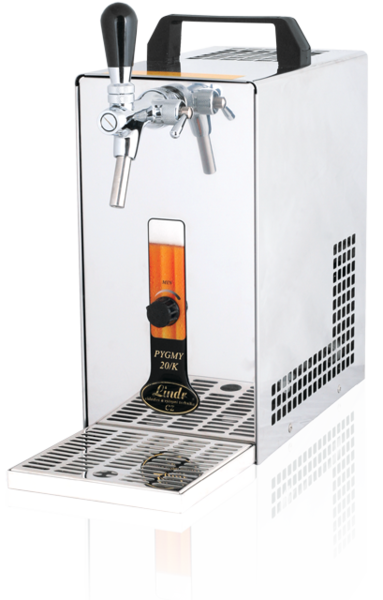 Lindr Pygmy 20 over counter cooler with 1 tap and drip tray, capacity 10 liter cold beer per hour. Lindr Pygmy 20/K over counter cooler with 1 tap and drip tray, capacity 10 liter cold beer per hour. With air compressor with fixed pressure. Lindr Pygmy 25/K Exclusive over counter cooler with 2 taps and drip tray, capacity 15 liter cold beer per hour. With air compressor with fixed pressure. 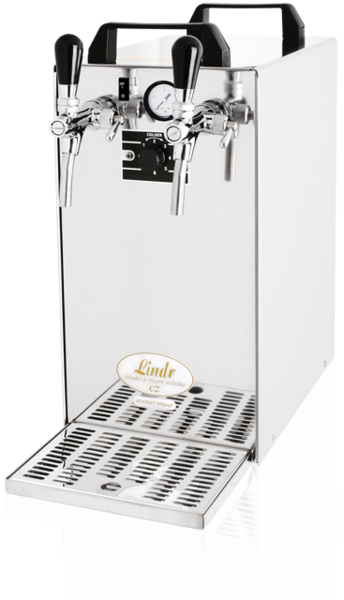 Lindr Kontakt 40 over counter cooler with 2 taps and drip tray, capacity 25 liter cold beer per hour. Lindr Kontakt 40/K over counter cooler with 2 taps and drip tray, capacity 25 liter cold beer per hour. With air compressor with fixed pressure. 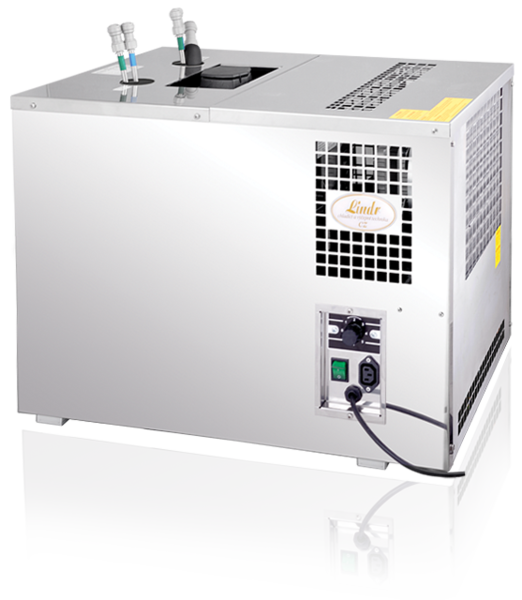 Lindr Kontakt 40/Kprofi over counter cooler with 2 taps and drip tray, capacity 25 liter cold beer per hour. With air compressor with adjustable pressure. Lindr Kontakt 55 over counter cooler with 2 taps and drip tray, capacity 25 liter cold beer per hour. 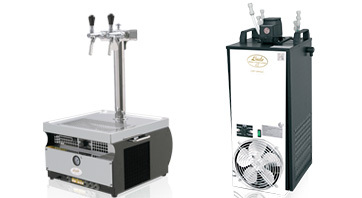 Lindr Kontakt 55/Kprofi over counter cooler with 2 taps and drip tray, capacity 25 liter cold beer per hour. With air compressor with adjustable pressure. 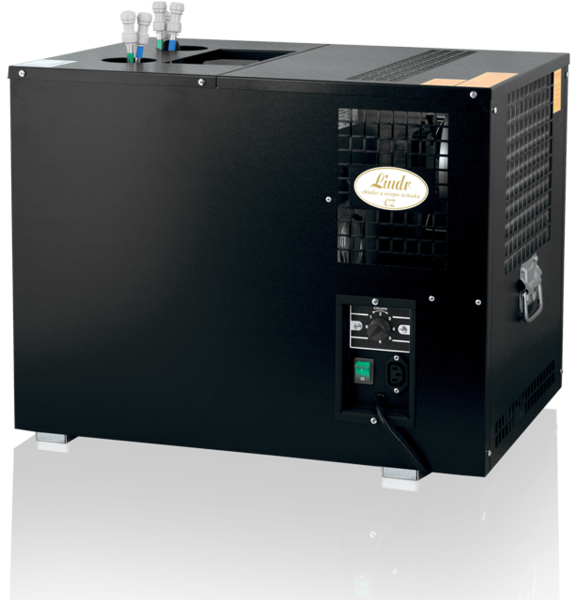 Lindr has an extensive assortment of under counter water coolers to suit every need. These coolers have low heights and fits under almost all (low) bars. 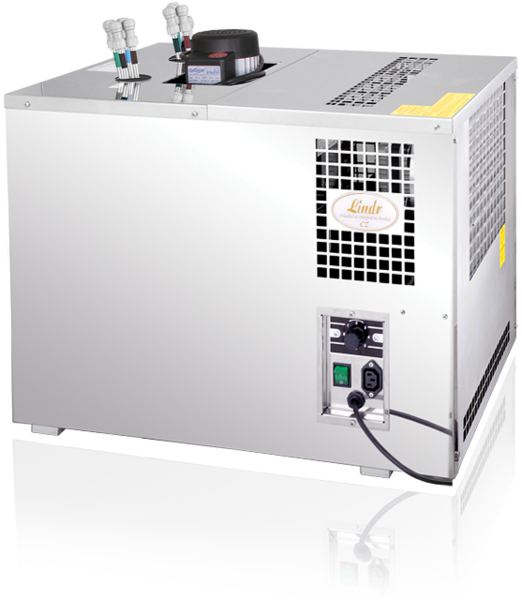 Lindr AS-40 ice bank beer cooler with 2 coils and cooling capacity at 20 liter cold beer per hour. Height less than 40 cm. Lindr AS-80 ice bank beer cooler with 4 coils and cooling capacity at 40 liter cold beer per hour. Height less than 50 cm. 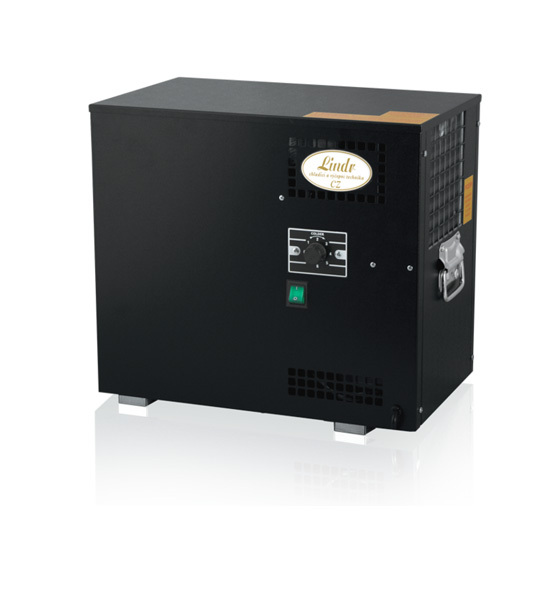 Lindr AS-110 Tropical ice bank beer cooler with 6 coils and cooling capacity at 60 liter cold beer per hour. Height less than 50 cm. Lindr AS-160 Tropical ice bank beer cooler with 6 long coils and cooling capacity at 80 liter cold beer per hour. Height less than 65 cm. Lindr CWP cooler stands out from conventional water coolers not only because of its design and processing quality, but because of the completely innovative arrangement of the cooling unit, high performance, light weight, small dimensions and simple design. The smallest cooler CWP-100 can easily cool 50 liter of beer per hour and is extremely suitable for events. The cooler does not need to build up ice as a normal ice bank cooler. This cooler only needs about 30 minutes after the cooler has been switched on. CWP-100 with 3 coils. Cooling capacity 50 liter cold beer per hour. CWP-200 with 6 coils. Cooling capacity 100 liter cold beer per hour. We manufacture our own beer coolers, both ice bank coolers and glycol coolers. These coolers have been on the Thai market for more than 10 years. High performance agitator which is easily serviced or replaced without disconnecting beer lines. Thermostat and all components accessible from outside the water bath. No need to ever disconnect beer lines for field service. Beer and coolant lines are grouped for easy installation and maximum cooling effect. High performance refrigeration package is tuned for tropical climates so you beer is always cold. Tough, corrosion proof insulated unibody construction. Same two sizes are available for glycol cooling. Please contact us for more details. The coolers are made to order.